J. Thomas’s newly released “God Sounds The Call” is an exciting story of Jason, a man who answered God’s call to fight against the evils present in the world. “God Sounds The Call” from Christian Faith Publishing author J. Thomas is a thrilling book on a man who has a mission given by the Lord to go back to Earth and follow his command for him to be one of his secret agents to fight against the ungodly ones, destroying the power of darkness. “God Sounds The Call”: a riveting book about the powerful demons and their evil rituals that God wants to be stopped to save mankind, thus sending someone faithful to the world as an instrument to face the surrounding darkness head on. “God Sounds The Call” is the creation of published author, J. Thomas, a deacon, Sunday school teacher, and a former member of the US Air Force and Army. Thomas shares, “I’m whisked in spirit through the gate to the majestic golden throne and I see God! He is dressed in a robe that reaches to His feet and has a gold sash around his chest. His hair is as white as snow and His eyes are like a blazing fire. His feet look like bronze glowing in a furnace. His voice is like the sound of rushing waters. His face is like the sun in all its shining brilliance. I fall down at His feet. 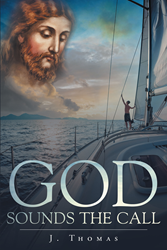 Published by Christian Faith Publishing, J. Thomas’s new book is a showcase of God’s miraculous and saving power in Jason’s life, God’s chosen agent of goodness who has already perceived that he died, only to hear God’s calling then realize that he has gained renewed wisdom and strength to fulfill God’s plan for him. This is a good versus evil story that arrives to the conclusion that God’s power is unbeatable; even if Satan and his followers’ plans of establishing a cult and populating an island with an army of demons against Christians seem challenging to overcome, God stays sovereign. View a synopsis of “God Sounds The Call” on YouTube. Consumers can purchase“God Sounds The Call” at traditional brick & mortar bookstores, or online at Amazon.com, Apple iTunes store, Kobo or Barnes and Noble. For additional information or inquiries about “God Sounds The Call”, contact the Christian Faith Publishing media department at 866-554-0919.